I enjoy dressing up our home for the holidays, but we have a lot of stuff going on, so decorations need to be easy to put up and preferably work for the entire season. For our dining table, I wanted a centerpiece that felt a smidge glam and festive, without being too committed to one holiday (i.e. 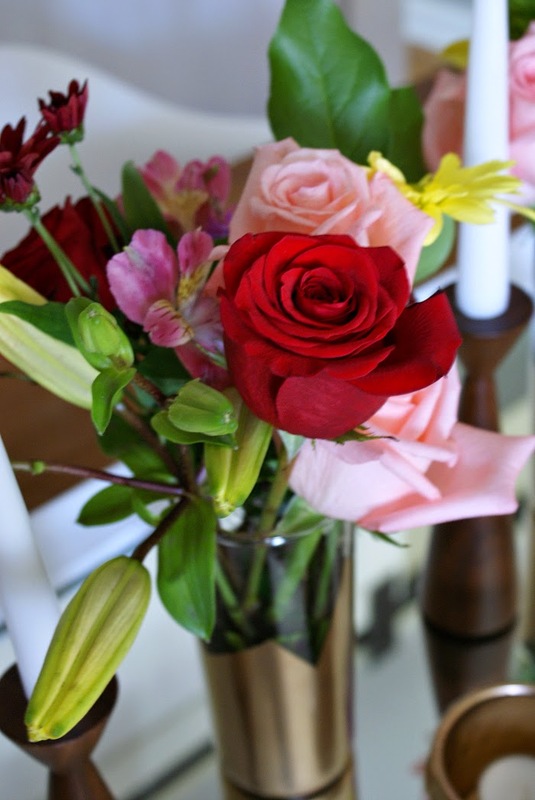 work from Thanksgiving through New Year's) This thrifted centerpiece fits my need for quick and easy, Plus, it will be a nice reason to buy fresh flowers throughout the season. Or, better yet, a reason for Jesse to buy them for me! 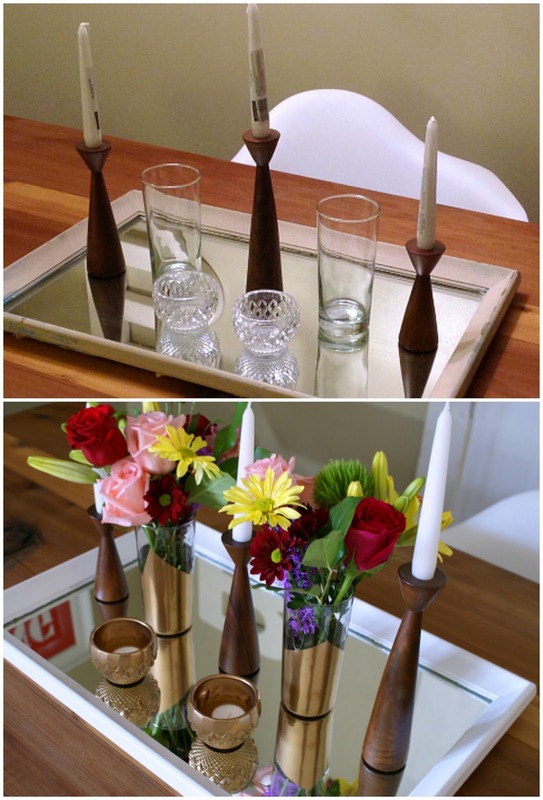 Vintage Danish modern candlesticks - a gift from my mom last Christmas. Best gift ever! I used Frog Tape to create a zig zag pattern on the Target glasses and then gave them as well as the candle holders a coat of Valspar metallic gold paint. The photo below shows the candle holders upside down. After painting the outside, I let them dry for an hour or so and then flipped them over to spray the inside as well. While the spray paint was drying and airing out, I freshened up the frame around the mirror with three coats of white semi-gloss paint. Once everything was dry, I added some candles and flowers from Trader Joe's and we were in business! I'm loving that this centerpiece will work throughout the holidays, it could work year round, really. What about you? Are you dressing your table for Thanksgiving and Christmas separately? Covering the whole season with one look? Or skipping it all together?